PRISTINA, KOSOVO: Pristina is the capital of one of former Yugoslavian provinces, Kosovo, in the Balkan region. The first thing that came to my mind before reaching Kosovo was that how many of the innocent lives were murdered here in 1998 in the hands of Serbian army. Kosovo is a country which is recognized by the USA and some European Union countries but it still needs more votes in UN to be recognized as an independent sovereignty. Serbian army killed thousands of citizens of Kosovo during the war and still doesn’t want to let go of it. Kosovo has its own border control, flag, and everything but officially it is still under Serbia (sad but true). They don’t want to be with the Serbs, they think themselves as Albanians and prefer to be with Albania because of their similar language, culture, and ethnicity. Albania can’t take Kosovo because of many political reasons. We saw more of Albanian flags in Pristina than their own blue and yellow star flags. Even in some government buildings and war memorials have Albanian flags. They went thru a tragic history against the Serbs and still suffering economically, politically, and culturally. Kosovo is one of the poorest countries in Europe with 80 – 85% population of youth (according to one of the staffs of our hotel, not sure how accurate the statistic is but it is true that there are way more youths in Kosovo). Kosovo is the poorest country in Europe and for the economic crisis, these young people may not have money in their pockets but have genuine friendly attitude towards foreigners. They speak somewhat good English and will help you whole heartedly just out of generosity. German is another language many locals speak here because of their ties with Germany and Switzerland. TIME of TRAVEL: We made a trip to the Eastern bloc of Europe during Easter break of 2014. Our first destination was Podgorica, Montenegro. From there we drove to Albania and Macedonia before reaching Kosovo. The weather in the capital was pleasant but we got severe snow blizzard in the mountains the day we started driving towards Sarajevo, Bosnia & Herzegovina. It was a 7 hours’ drive, but we ended up driving about 15 hours all together in 2 days changing some routes to reach Sarajevo. OUR HOTEL: Our hotel was a real fancy one in Pristina, called Nartel Hotel. It’s a 5-star hotel, about 15 minutes’ walk from the city center. The taxi is so cheap here that we took taxi on both ways, think it was only 3 euros for each way. We had a big room with a king-sized bed and a sofa bed. Parking, Wi-Fi, and grand breakfast buffet were all included. The staff here were very friendly too. Our trip to Prekaz, a small village in Kosovo, was taken care by an employee in this hotel. He provided the transportation and gave a tour in Prekaz for 50 euros. Pristina has some other high quality hotels (one of them is Swiss Diamond Hotel) but this hotel really has a homely feeling and smiley faces everywhere. EATING and SHOPPING: Pristina has tons and tons of fast food at every corner. Although we didn’t try any, Kosovan burgers supposed to be very tasty and full of flavors. Two of our meals we had were in our hotel restaurant, Nartel. The day we were out in Pristina city center, we sat down in a Mexican restaurant near Mother Teresa Street. Food in Pristina is very cheap for a good portion. We didn’t have any traditional meal here and wasn’t sure where to get any. But I wish I could try their fast food burgers at least once. Pristina is also known for brewing best macchiato outside of Italy. Sit down in the one of the cafes and enjoy a cup while gazing over the locals and their lifestyles. In the city center, Mother Teresa Street is a nice place to do some shopping. There is only one souvenir store at the beginning of the street towards the university. You can find both Kosovan and Albanian souvenirs here. Other than that we really didn’t see any other place where we could find some local signature items. We walked by tons of silver and gold jewelry stores in the old quarter, not sure about the quality of them but bargain works almost everywhere. 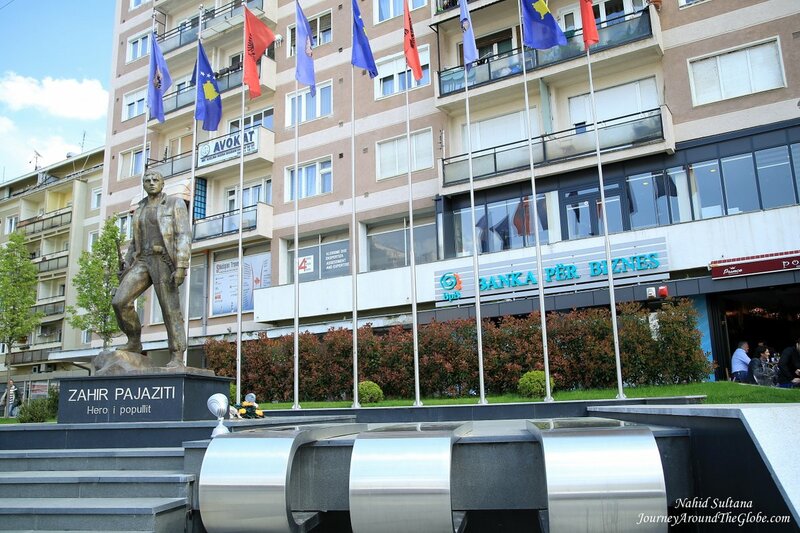 PLACES WE’VE VISITED: We had only a day in Kosovo, half a day in Pristina and few hour for Prekaz. We took a taxi to go to the city center and did everything on foot from there. There is a tall statue of Bill Clinton somewhere not too far from city center that we saw from our taxi. Pristina Ethnographic Museum is something we really wanted to see but couldn’t find. Even the locals couldn’t give us any information on its location. 1) MOTHER TERESA STREET: This is the main pedestrian street that runs from near University of Pristina towards the statue of Iskander Beg. It’s a long stretch of wide cobbled street with trendy shops and restaurants. This modern pedestrian zone is the heart of Pristina and a perfect place to meet and watch locals or to hang out any time of the day. 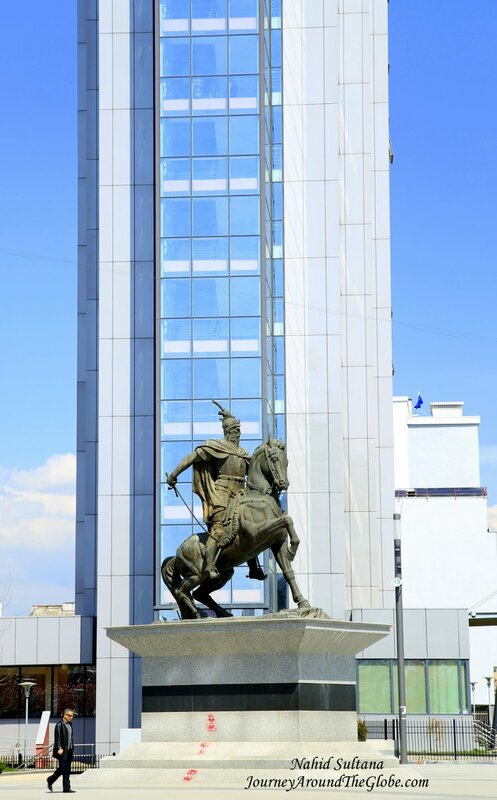 Look for the statue of Kosovo’s first president Ibrahim Rugova near Iskander Beg’s portrait on Mother Teresa Street. 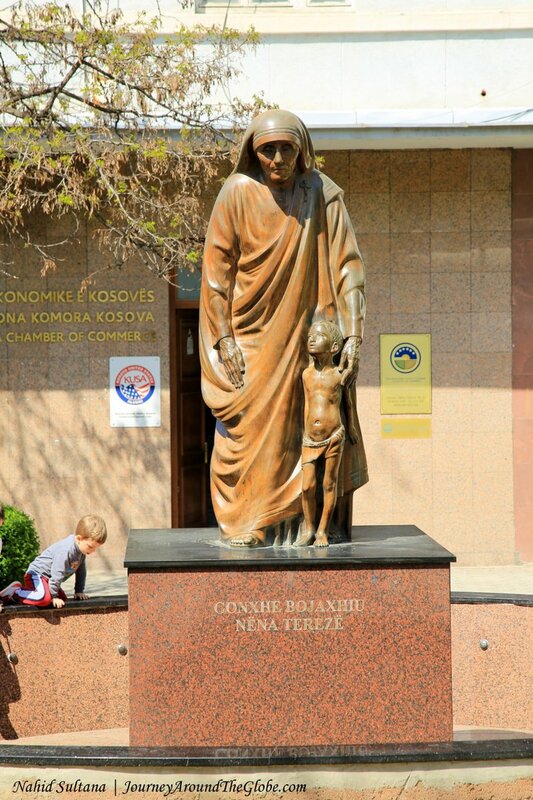 2) MUSEUM of KOSOVO: Few steps from Mother Teresa Street, we came to this museum which was closed at that time but the care taker let us in for free just to check out the first floor. The museum building itself was nice but there wasn’t really inside to see other than some photographs. Upstairs has some historical artifacts which we couldn’t visit. 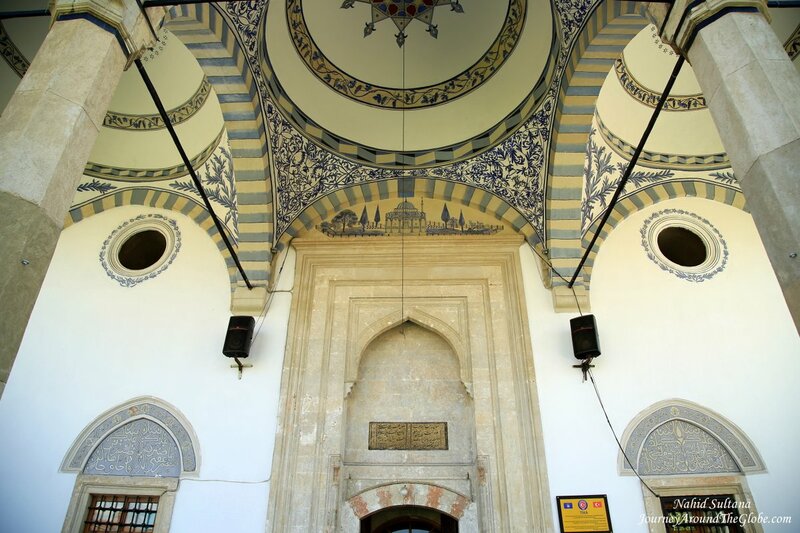 3) KING MOSQUE: This is an old mosque located in the old quarter of Pristina and is known as “Sultan Mehmed Fatih” Mosque. The locals don’t know this mosque as King Mosque and we had to ask few people to find it. It’s a spacious masjid with grand entrance and a calm courtyard. Don’t miss the tall minaret beside the mosque. Inside, you can see the high dome and decorative mihrab and windows. There is no entrance fee but since it’s an active mosque visitors are not allowed during prayer time. There are couple other historic mosque on this street which were closed, one of them was Jashar Pasha Mosque and a clock tower. 4) OLD BAZAAR: Old bazaar is an atmospheric place outside King Mosque where locals come for daily grocery. 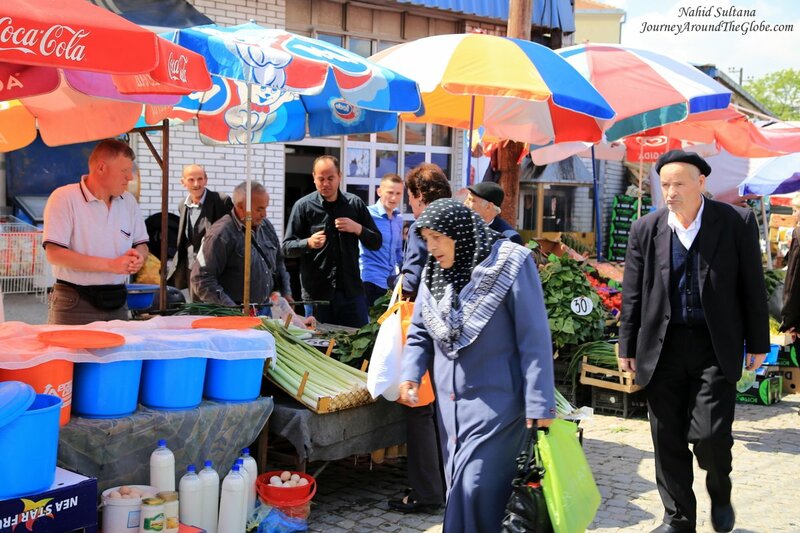 You can find almost anything and everything in this outdoor market from fresh produce to electronics to tobacco, clothes and etc. It was very crowded at noon with lots of shoppers and some cars trying to squeeze thru the narrow roads. 5) NEW BORN: This a big sign in front of American School of Kosovo to celebrate Kosovo’s freedom and independence. 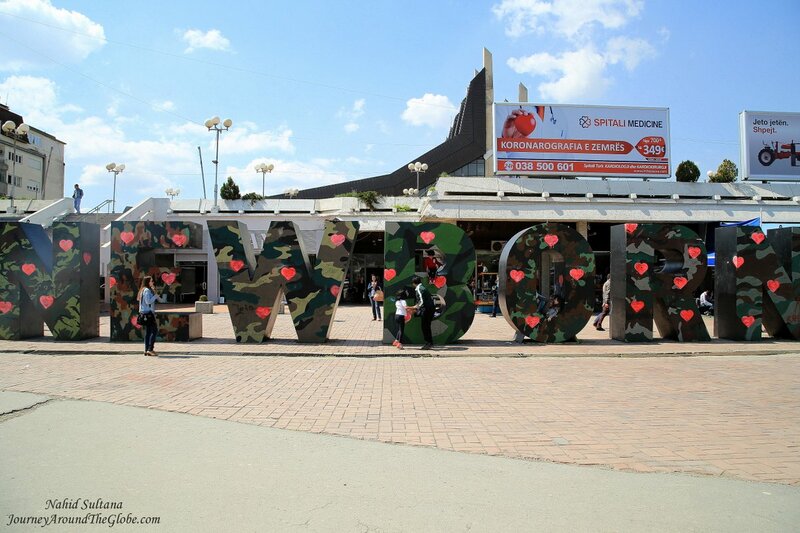 The letters are written in camouflaged green and black colors similar to army uniform. Lots of restaurants and shops surround this place. 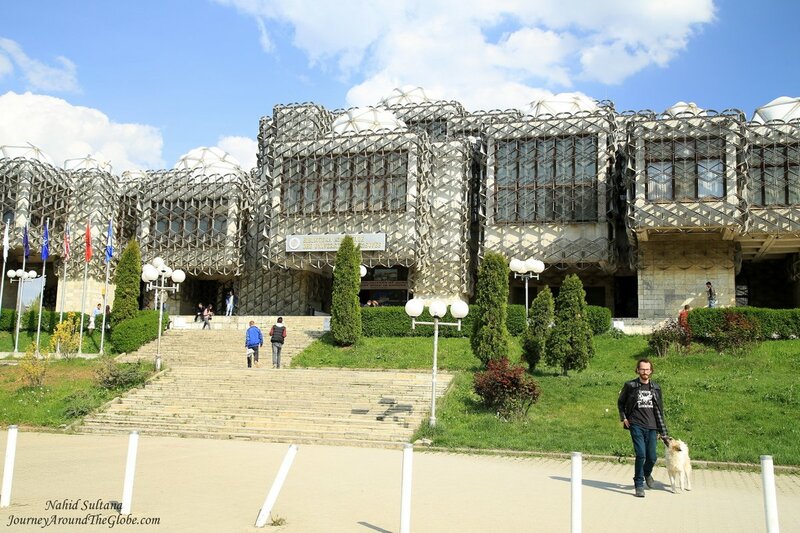 6) UNIVERSITY of PRISTINA LIBRARY: This library building is definitely worth a look. University of Pristina is located a couple of minutes’ walk from the city center opposite of Mother Teresa Cathedral. The huge blocks of bricks of this building is covered with massive chains. We didn’t go inside the library, just roamed around the university campus and walked past the library. 7) MOTHER TERESA CATHEDRAL: Opposite of University of Pristina is Mother Teresa Cathedral. It looked like a newly built place and lots more needed to be done. It’s a spacious church inside but very simple and empty. 8) TRIP to PREKAZ: So the idea was that we wanted to see some of the war time destructions during Yugoslav war in Kosovo from the 90s. We asked our hotel reception and one of their staffs offered to take us to a village, called Prekaz, for a short tour. He charged us 50 euros all together – car, fuel, and tour for total of about little more than three hours. Prekaz is about 60 km from Pristina and took us about an hour each way. It’s located in the town called Drenica. 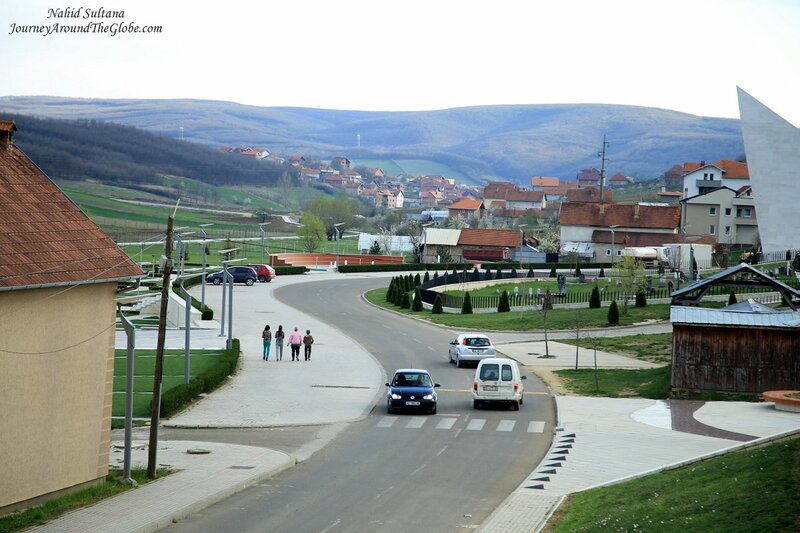 This is a small town where 59 people from the same family died fighting the Serbian army in 1998. The house that still stands is the house where Jashari family lived. Adem Jashari and his brother Hamze Jashari lived in this 3-story house with their families. Both the brothers were members of Kosovo Liberation Army (KLS). 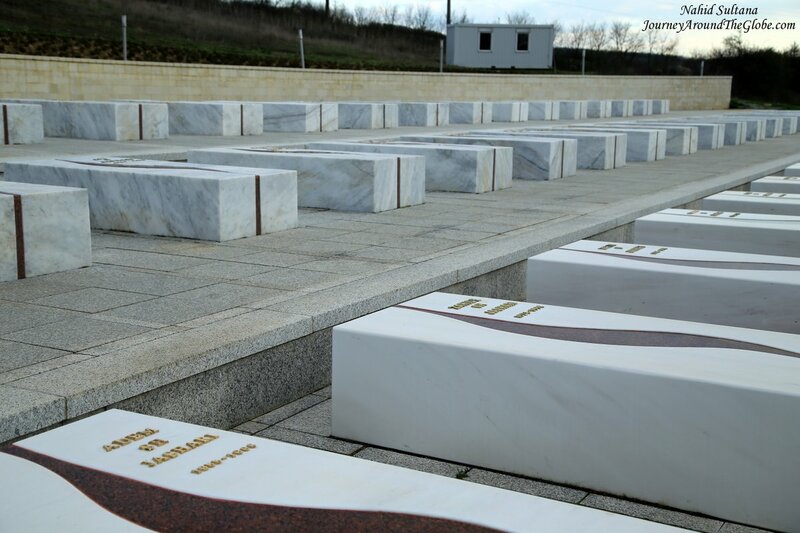 They fought for three days on the 5th, 6th, and 7th March 1998 until every 59 family members were dead in the hands of Serbian army. The house is kept the way they left it. 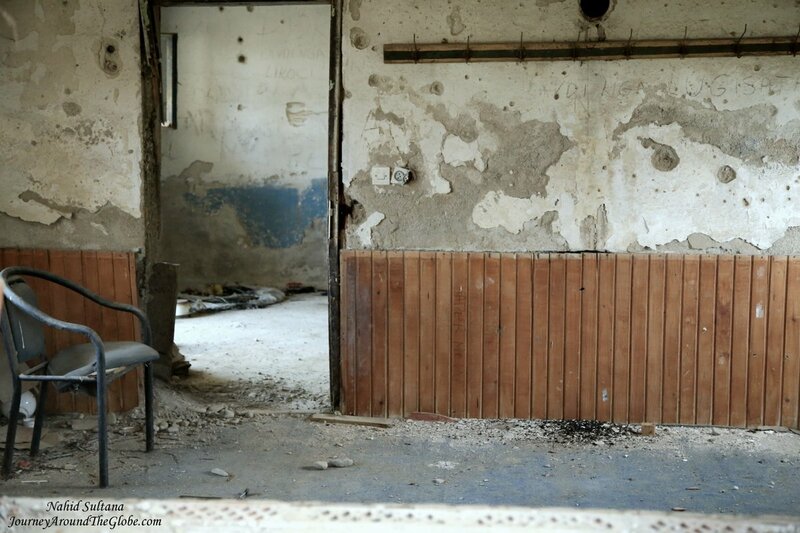 You can see the bullets and grenade marks on the walls and debris on the floor. The house itself is a memorial to the Jashari family to keep their legend and sacrifice alive in Kosovo. Opposite of Jasharis’ house, is the memorial for this family that was built in 2013. Our guide was saying there are yet more things to be added to it later. It is a nice and big park/memorial for the 59 members that died in 1998. You can see the marble tombs of those braves on the slope of this memorial. Kosovan army guards this area in honor of the deceased Jashari family members. Some of the other family members of Jashari family is located opposite of the park across the street. Another interesting thing to see here is that you see an Albanian flag flying at the corners of this memorial and not a Kosovan flag. I have to say your posts are extremely informative and you are the biggest globe trotter I follow. Keep it up!